Shampoo that generates lather, always contain detergent. Herbal shampoo is no exception of this. Actually, lather doesn’t generate without detergent. Most of the shampoos contain Sodium Laureth Sulfate (SLES, Wikipedia.org/SLES) or Sodium Lauryl Sulphate (SLS, Wikipedia.org/SLS). SLS is used in any task requiring the removal of oily stains and residues, is the key ingredient of engine degreasers, floor cleaners, and car wash soaps. If you want to avoid application of detergent, search for a shampoo without SLS or SLES. Or you can use a home-made mixture of Soap Nut (Botanical Name: Sapindus mucorosai), Acacia (Botanical Name: Acacia Concinna) and rosemary for washing hair. Oil makes hair heavy and dirty. Oily hair attract dust and dirt. Therefore, applying oil after hair wash doesn’t have any benefits. Besides, the claim that applying hair oil gives long hair is a misconception. Market is flooded with several shampoos claiming to have extra protein. The notable point here is that while washing, protein in the shampoo doesn’t enter the hair or its roots. Shampoo’s main role is limited to cleaning the external surface of hair, that is, its cuticles. Hair do need protein but it comes from a good diet. Many people shave their head or trim their hair short when undergoing serious hair loss. They think short hair will reduce hair fall or new hair after going bald will not shed. However, this is a misconception. 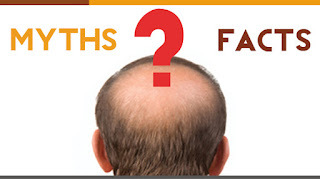 Going bald does not have any effect on hair fall. Most of the people wash off shampoo immediately after its application or keep the shampoo in the hair for very long. They think prolonged application of shampoo in hair will benefit hair. But the fact is that the contact time of shampoo to hair should be around five minutes, neither less nor more. This allows appropriate time for cleaning of dirt in the hair. Hormone level change during youth or puberty makes the scalp oily and causes dandruff. People think applying oil in hair will help them get rid of dandruff though it is not true. Oil doesn’t help remove dandruff in any way. Dirty hair causes more hair fall, and shampooing hair daily reduces falling of hair. Fixed amounts of hair fall every day. If hair are washed after a long gap, then also those hair will fall. It is possible that most of the hair fall happens during the massage before shampooing and while shampooing you find less hair fall. Rains are a synonym of loads of fun but also signal the need for extra protection, be it of your vehicle or yourself (your hair in particular). The monsoon humidity robs hair of its bounce leaving it limp and lifeless. The scalp constantly sweats leading to itching, scratching and increased hair fall. Humidity weakens hair making it easily breakable. If you get drenched in the rain, shampoo your hair as soon as you get back home. Rainwater carries atmospheric pollutants that weaken your hair roots causing hair fall. Also, it is recommended that you use a mild anti-dandruff shampoo. Avoid hot hair treatment such as perming, straightening or coloring in the rainy season. Ironing hair is not advisable either as the repeated flow of hot air can cause damage to hair resulting in breakage and split ends.